Wait-time is giving students, particularly a large group of them, time to think before calling on someone to respond aloud. In my blog post on Ways to Get Kids Deeper Into Text, I call it "Pause with Intention." 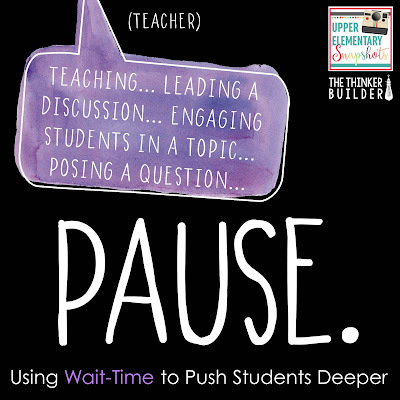 Here, I want to zoom in on this idea of wait-time and show you the power it can have on how your students think. We'll pair some simple techniques with that nice long paaaaaaauuuuuuse, and we'll look at the different effects it has on your class. 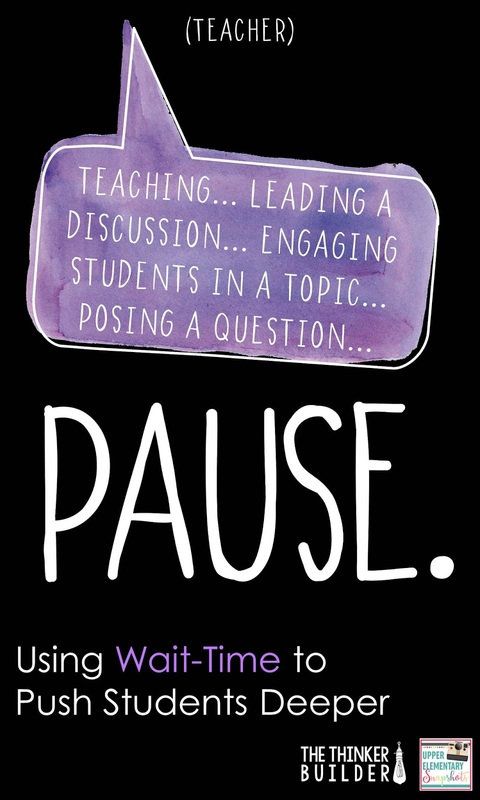 By itself, when you pause your instruction or dialogue with your students, what happens? And I'm not just talking about a wee little take-a-breath pause. I mean a drawn-out, five-Mississippi, capital-P Pause. One of two things pretty much always happens, depending on the student: for those whose minds were wandering a bit, an abrupt pause acts as a trigger to refocus (Wait, why isn't she talking? What did I miss? ), and for those who heard what you said "pre-pause," they have a chance to process it. So grabbing students' attention, and giving time to process... Let's go further now to see how we can use wait-time to its fullest, to get all students thinking harder, deeper, differently. Here are three scenarios, each growing in complexity, to harness the power of a pause. #1: The "Question, Pause, Rephrase, Pause"
This is a pretty simple way to use wait-time, but it brings together both of those common effects of a long pause: gaining attention and time to process. What we want to do is ask an open-ended question that has more than one answer. Then we pause. During this pause, we make eye contact with several students, walk the room a bit, and scrunch up our face and tilt our head like we are processing the question too. After this first pause, we've got several students ready to respond. (We ignore them for now, even asking them to "hang on a sec" if their responses start leaking out.) We've got several more that have been mulling over the question, thinking about their response. And we've got several more that we've at least refocused because of our sudden silence. Then we're going to rephrase our question. This gives those refocused students a second chance. It also gives the other students a chance to check their thinking against the rephrased question, giving confirmation, confidence. We give more wait-time, holding back the urge to fill the silence. And then finally, we give a few students the chance to share their thinking aloud. It might go something like this: (during a lesson on visualizing story details) "So boys and girls, which details really help you imagine what is happening? ... pause ... pause ... (face scrunch, head tilt) ... "I see your hand, Kevin, hang on." ... pause ... (forward lean, scan of the room) ... pause ... "What did the author write that brings the story to life? ... pause ... pause ... pause ... "What are you thinking, Kristen?" (and the discussion continues from there). #2: The "Pause First, then Invite"
This is not a very complicated technique; it's just maybe not as intuitive as the first. I love using this strategy during a novel read-aloud. As I'm reading to the class, I'm on the lookout for a poignant sentence or phrase, some little nugget dripping with meaning. And when I land on it, I go ahead and read it, but then immediately throw in a big pause. I look up from the book and scan the class, wide-eyed, like a bombshell was just dropped. A few students instinctively pick up on the significance of the text just read, but most are staring right back at me wondering why I suddenly stopped. But it's my facial expression that convinces these students that I just read something worth stopping for. Sometimes no question is needed to get students thinking deeply, just a well placed pause. At this point, after the pause gets a bit awkward, I say, "Did you hear that, boys and girls? Let me read that again." And after rereading the important bit, I'll simply invite students to share their thinking. #3: The "Boil it Down, Pause, & String 'em Along"
This technique is a little more complex, but really packs a punch. It works well during a discussion that revolves around an issue with multiple sides. At some point during the discussion, the idea is to boil down the issue to a vital yes-or-no question, followed by your pause. But here's the kicker: you do such a good job of getting the class to think about their answer to your yes/no question (drawn out pause, eye contact, scrunched face, etc.) that instead of sharing these answers aloud, you pull them right into additional branches of thought by asking follow-up questions. It might go something like this: (during a social studies lesson on citizenship/voting) "So now that we've talked about the requirements to be able to vote, I have a question for you, boys and girls. Let's say that you meet all the voting requirements and it's election day, but you don't care for either candidate. Is it okay to just NOT vote? Think about that for a second. If you don't particularly like either candidate, should you even vote at all? ... pause ... pause ... pause ... pause ... (Here come the follow-up questions.) Hmm, should you even need to 'like' a candidate in order to vote for her/him? Maybe 'like' is the wrong word. What WOULD make you feel like you shouldn't vote? What if you didn't know much about the candidates? Should you vote then? Is that a good enough excuse? ... Jill, what are you thinking?" (discussion follows). So I presented a critical question in a straightforward yes/no format, gave wait-time, then followed up with additional questions that expanded the topic. The point is, you are getting students to strengthen their thoughts prior to sharing aloud. Often when we start the conversation right away, only a few students participate, while the rest are content to disengage, nodding their head in agreement, but are let "off the hook" from thinking hard themselves. This way, you've given all students a fair chance to develop their own thinking. 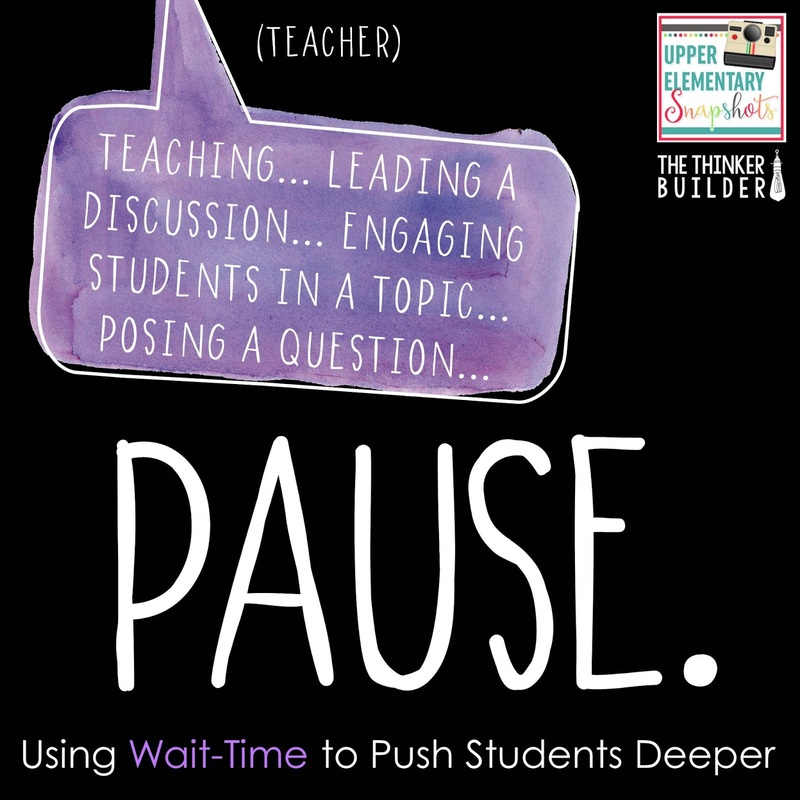 Now with a little more knowledge of what you can do with something as simple as a pause, and an understanding of the effects it has on your students' thinking, you can better use wait-time to push your kids into deeper thought. 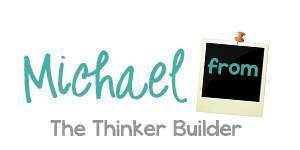 Come visit me at my blog, The Thinker Builder, for lots more ideas and tips to help you build readers and writers who think boldly and deeply. And check out some of my resources in my TPT store.